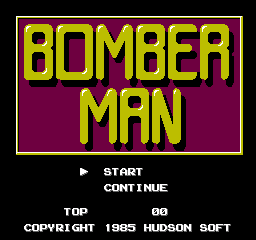 Bomberman marks the first second appearance of the titular character in his familiar robotic form in a port that was coded in one 72 hour session. Two-player mode is conspicuously absent. 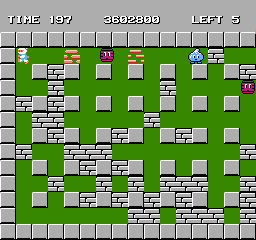 Setting RAM address $94 to a non-zero value before entering a level will cause the game to render hidden tiles (doors and powerups) as red half-destroyed walls until they are revealed. In the screenshot above, the left wall is a door, and the right wall is an item. While these items are used, the conditions that must be met before they appear are so amazingly obscure, it's very unlikely you'd ever see one by accident, save for maybe the Bonus Target or Famicom. Note that you only have about eight and a half seconds to find and grab an item before it disappears! Method: Reveal the exit and walk over it before killing any enemies. These come from the space shooter Star Force, which was ported to the Famicom by Hudson Soft. Method: Circle the outer ring of the level after killing every enemy in the stage. Appears in Star Force as a 1,000,000 point bonus item. Method: Reveal the exit, walk over it, and continue to walk in any direction (do not let go of the D-Pad) for approximately 15 seconds before killing any enemies. Method: Kill every enemy, then create 248 chain reactions with your bombs (one chain reaction = one bomb detonating another). NOTE: This bonus cannot be obtained if you have the Detonator! Method: Kill every enemy without destroying a single wall. This is a portrait of programmer (and later vice president of Hudson) Shinichi Nakamoto. 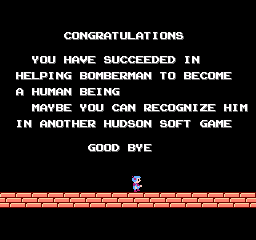 Method: Destroy every wall and bomb the exit three times without killing any enemies (including those that come out of the door). This is the hero of the goofy computer adventure game Dezeni World. 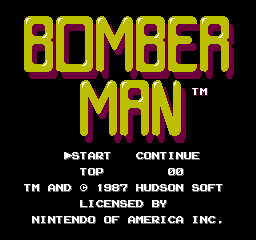 To make room for the expanded copyright information in the North American release, the border around the title was removed and the game options were placed side-by-side. 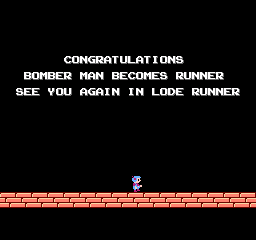 The ending text was beefed up a bit for the North American release, obscuring the Lode Runner plug in the process. This page was last modified on 28 September 2018, at 16:08.